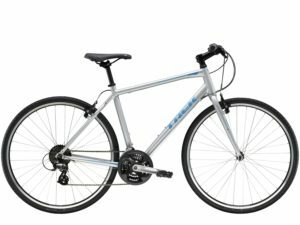 We carry a focused selection of Trek’s Hybrid and fitness bikes, selected for their durability, quality, and practicality to our area. Make sure to check out our Electric bike page if you are interested in getting a boost! Feel free to stop in anytime, we are always more than happy to fit you to a bike for a test ride, and answer any questions you may have! The Trek Verve is a great way to get to work or class if you want to be a bit more upright. We also have these available for rental! Verves are also available in a Step-Thru, or low standover frame. The Trek FX 1 is a great introduction into the FX line of fitness bikes. With a solid but inexpensive build, the FX 1 makes a great bike for commuting between Amherst and Northampton or zipping around Campus! Like all FX series bikes, the FX 1 is available in a low standover model. Our “Bread and Butter” hybrid, the Trek FX2 is awesome for commuting and checking out the local bike trails and roads. Lighter and even sturdier than the FX 1, the FX 2 is our most popular bike! The FX 2 is also available with disc brakes for better stopping power and is available in a low standover model. The Trek FX 3 has all the same commuting capabilities as the FX2, but in a lighter and smoother package. It is an excellent option for getting into riding longer distances with the comfort of flat handlebars! It is available with disc brakes and in low standover models. 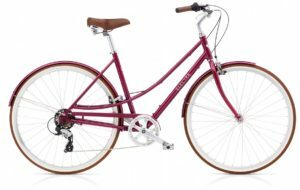 Electra’s Loft 7D is an ultra-classy town bike, perfect for getting to class, grabbing a coffee, or getting to Northampton. These have a very simple drivetrain with just seven speeds, and a lightweight aluminum frame. These are some of our best looking bikes! The bikes shown are just a sample of what we carry or can order. Please give us a call or stop in with any questions!